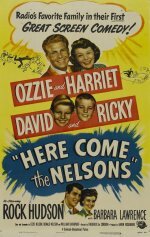 In between the radio and TV versions of their long-running sitcom, Ozzie and Harriet Nelson, plus sons David and Ricky, hit the big screen with this lively tale. Advertising man Ozzie (yes, folks, he really had a job) must cope with trying to develop a women's wear company's campaign while the town's centennial celebration has him and Harriet fighting over rival houseguests . . . and hers is Rock Hudson!